This is my pair, which I just finished a few days ago. (The gun is an antique reproduction that belonged to my grandfather.) I'm super chuffed with them; I really like the copper and dark brown leather together. You can see the difference in eye cup sizes here: I thought John's were way too long, so we made mine much more petite and closer to the face. The iridescent film in my goggles turned out to be our favorite part, and was an easy last-second addition. 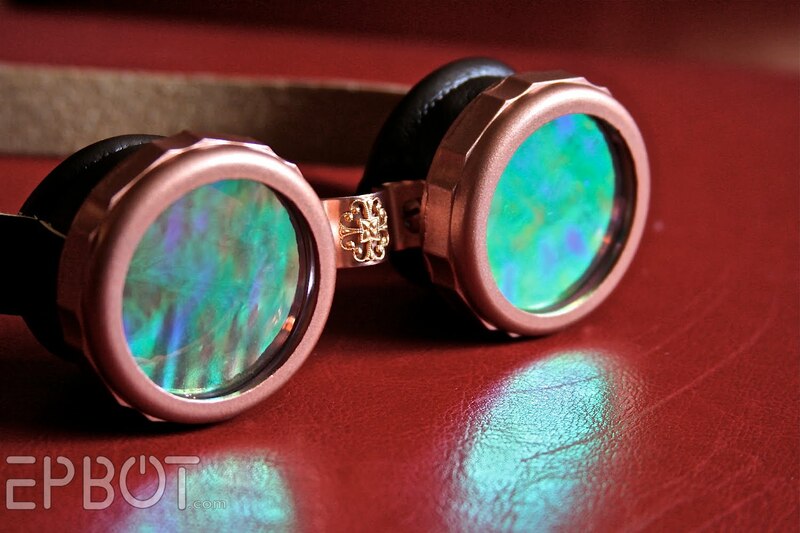 It makes the lenses look holographic, and I looove all the colors. Now let's try the photo cube, shall we? 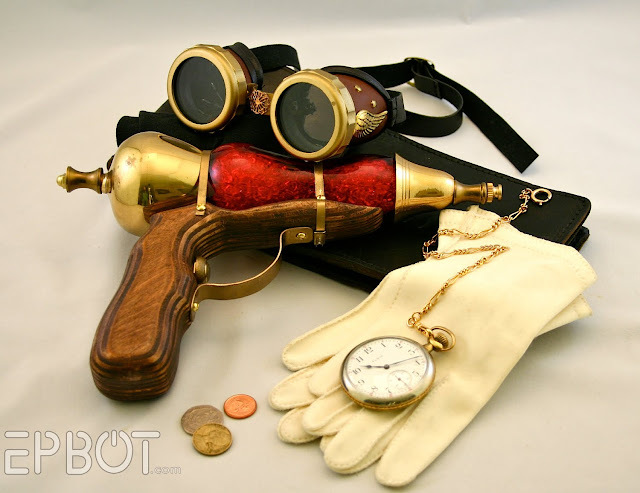 John's gun and goggles again, along with an antique Elgin pocket watch from my Dad. I have a problem with gloves fitting my teeny hands as well! I just normally buy kids gloves but love the idea of older gloves instead! :) And the goggles look fantastic! Those are amazing! Well, everything in those pictures are amazing! But, but ... where's the shot of them ON you? They look awesome. You both did a fabulous job. Also, you are not alone with the glove issue. I can't to show my kids (you know when they're up) I can already hear the demands for halloween costumes. One time when I was walking through Downtown Disney, there was a steampunk club taking group photos in front of the Adventurers Club. Apparently there is a Central Florida Steampunk club. Who knew?! I also have the glove finger problem! Is annoying enough to make me make my own gloves. WV: weisabi - Weisabi making our own stuff for our hobbitses hands. 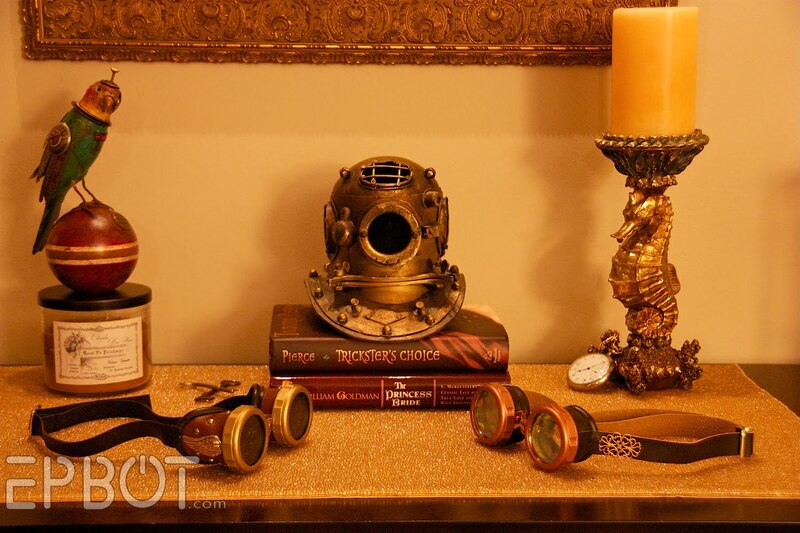 Very nice, I like the way you used the filigree as decoration, it's a nice touch without making the goggles too fussy. I only got into using filigree with my leather recently and I'm still getting a feel for it, but I've found some wonderful places to get supplies so I have a lot to work with. I'm definitely looking forward to the tutorial, I've never had anyone ask me to make goggles but I figure it's just a matter of time. I, too, have tiny hands and purchase kid gloves. Or those wonderful small ones that stretch to fit! GREAT photo staging and wonderful creations. LOVE! My son is going to try and make the 'ray' gun...a tutorial would be nice after he attempts it without directions. Do you have teeny T-rex arms to go with your teeny Hobbit hands? ;) But I sympathize - I actually have the problem that my palms are too wide for women's gloves, so I have to go a size larger than what I would usually wear. So did you make those goggles from scratch or did you spruce up some goggles you already had? I really like the holographic look too, although I imagine looking through them might be like having two kaleidoscopes over your eyes. Great staging ideas, too! I must have hobbit hands, too. Fortunately, the gloves I wear (surgical) come in small sizes, too! I also have a hard time with watches being too big for my oddly tiny wrists. I'm 5'8", so I'm far from petite! I envy your small hands. Gloves can usually be shortened, but I can never find gloves to fit my long ET fingers. They always end up looking like strange webbing or weird man-gloves. I have the same problem as Zombie Edward up there... My fingers are long and my hands are, well, "Man-Hands". The nails are broad and suchlike, and they're just big, but not gross. So, I always buy those magic-gloves that stretch (and get a new pair every year). What I'm planning on getting this year, if I can find the pair I want, is leather driving gloves. No fingertips, so as long as the fingers aren't narrow and the hand part fits, they will fit the way they should. Love to read your stuff Jen, and John as well! Ya know, I have the opposite problem with my hands. Gloves are never long enough in the fingers for me. I'm super jealous of your goggles and beautiful photos!! They're magnificent!!! Can't wait for the tutorial. I'm curious to know how you did the iridescent thing. Small hands, large gloves, over here too. I Also buy kid gloves which my hubby then tries to cram him gigantor hands into and stretch all out of whack. 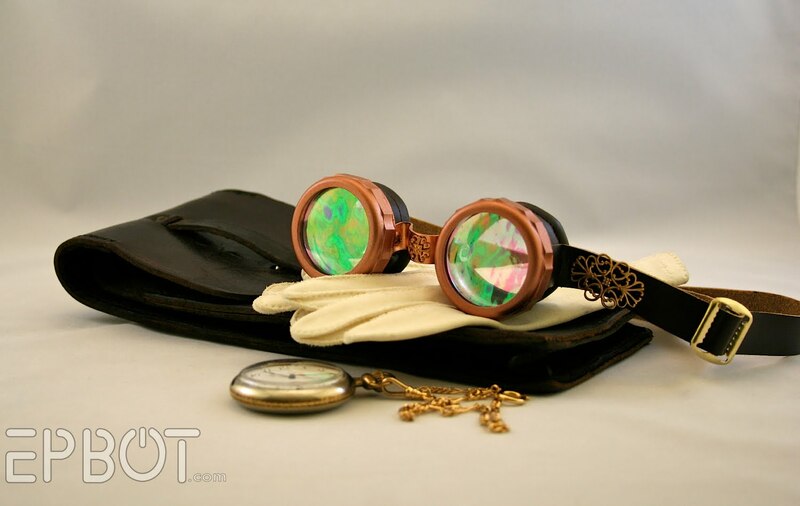 I love the goggles and can't wait for the tutorial as I think a pair of those on the Mad Hatter's hat which will hang from our Steampunk Alice in Wonderland bed post are a must. Oh and I just discovered for a VERY reasonable price we can have custom fabric made, can you say Steampunk Alice curtains anyone! Wow, those are great! Love the ray gun too---very nice! I don't have much problem with finger length in gloves, I just can't stand to wear them if I'm wearing rings...drives me nuts so I usually just don't wear them. Gloves always hang off the tips of my fingers, just a little bit. I'll have to look for older gloves. I loved your set-ups. It would be hard choosing the best. I hope you mean there will be two tutorials! One for the goggles and one for the ray gun!? Oh my gosh --- I'm in love --- WITH GOGGLES. I swooned when I saw the wings on John's glasses. Congrats on such beautiful projects. When you get to the tutorial, I am interested to know if you sealed the copper (and with what) or if you plan to let it verdigris. Such cool glasses. I don't know that I'll make any, but I LOVE reading your tutorials. Re: the gloves? YES. Not just dress-up gloves, but regular old keep-your-mitts-warm-in-winter gloves. When my husband's grandmother died, he and I were just dating (but seriously dating - we became engaged just 2 months later). I was traveling for work when it all happened and I missed the death and the funeral and everything because I couldn't get home. When I finally made it, he gave me a box of his grandmother's things that his family wanted me to have - rings and TONS of old-fashioned white gloves. They knew my hands were tiny, and none of them fit anyone else there. I think I have a LIFETIME of gloves in that box! I think we have the same teeny tiny hands! (Size 5.5 ring? Glove size XS?) Another problem with small hands, finding a watch that doesn't look huge. I went without one for years until I found Skagen extra-small watch faces. Suddenly, I'm not wearing my Dad's watch anymore! Too bad they aren't steamy. My sons recent obsession is the movie Robots. Once you get past the Mel Brooks and Robin Williams humor (yes, in a kids animated film! Win!) You begin to notice the beautiful steam punk world. If you haven't seen it, you should! I'm drooling over the talent. Well done! I have swollen knuckles from arthritis so gloves are a b!tch for me. I agree with @cheezyk - where' the shot of you guys wearing them? Count me among those with problems with gloves. My hands and fingers seem to be proportioned like men's but in a women's size. If I can find men's small or boys XL gloves those usually work. Fortunately I don't have a lot of use for gloves that look like they should be worn by a woman. So it's not a huge deal...don't get me started on feet though. And amazing pictures. I LOVE the ray gun. And would love to have one for myself...no idea what I'd do with it, but it's so pretty and shiny! And yes, I have that problem often with gloves. I think I'll be knitting my next pair with an altercation to the finger length of a pattern. Those are fantastic! and the staging in the photos is beautiful. I seem to have the exact opposite problem with gloves which means not antique gloves for me. can't wait for that ray gun tutorial. Parrot + helmet = AWESOME! yeah, I have the opposite problem with gloves. Usually the fingers are too short and I have weird issues with not having enough range of motion, due to the palms creating a "webbing" between my fingers. FYI, most gloves can be shortened. Back in High School my friend and I did Shields (related to drill team) and I altered her gloves to fit her hands - she had lost finger tips and knuckles as a child, and our gloves we wore with our sparkly uniforms were uncomfortably floppy for her. It's fairly easy. Just turn the gloves inside out and put some stitches in the tips. If there's lots of excess fabric (like in her case) you can just trim it off. If you're worried about the fabric fraying use that Fray-Check stuff from the fabric store. YES! Please, tutorial! That looks amazing. I can't wear many antique or modern gloves because my hands are too wide. I've found a couple of pairs in thrift stores that I can wear without excessive difficulty, but it's still annoyingly difficult. These are great! My favorite in this group is picture #7, the first photo cube shot. Great composition. And my favorite item is the (pewpew!) raygun. I think you and John are among the best arts-and-crafters EVER! Regarding glove (and hand) sizes, I’m exactly the opposite. Anyone who plays the piano will get this: I can easily play a tenth. That’s two white keys bigger than an octave. I almost always wear men’s winter gloves, just because I can’t even get my hands into most women’s gloves. Extra-long arms, too. When I’m not shopping in the Talls section, I can often be found in the Men’s section. It’s sometimes very hard to be stylish, and I’m only 5’10”! The obvious solution would be to sew my own clothes, but I’m really out of practice. (Over 30 years out of practice.) If I ever start sewing again, I’ll pick a Super-Jiffy pattern! I like the shots with the tray. It seems like you just got home from a long day of airshipping and dropped all your accessories in the key tray bu the front door. I had another thought, while reading through all the comments above. It seems that people tended to be smaller prior to the mid-20th century. One day I was browsing around on a website that has vintage clothing for sale, like gowns from Jane Austen’s day, or the Victorian era, or Edwardian, or Roaring Twenties. Great fun to see these fabulous clothes, but in reading the descriptions I would occasionally see “in a wearable size”. Seriously, almost all of the old gowns were in super-petite sizes, like size 0 or 1. Very interesting. It totally makes sense that antique ladies’ dress gloves would be tiny. First- love the goggles! They are gorgeous and I hope there will be a tutorial for those as well! Second- I also have teeny hobbit hands and wear super small Victorian gloves. I'm also 6 ft. tall...yeeeaaahhhh. My grandmother(who was born in 1910), left me her entire collection of gloves when she passed last year. As a furry-toed, 4'11" lady, this was glorious. Magenta suede, ivory silk, buttercreme leather, espresso brown kidgloves, black lace . . . about 20 pairs in all, ranging in length from just below my palm to right under my shoulder. My favorite pair is made of so-brown-it's-pretty-much-black leather and lined with silver badger fur. Definitely the best part is all the fingers fitting perfectly. I wonder if gloves were made to fit different fingers back then, as opposed to mass-produced "cookie cutter" style today. 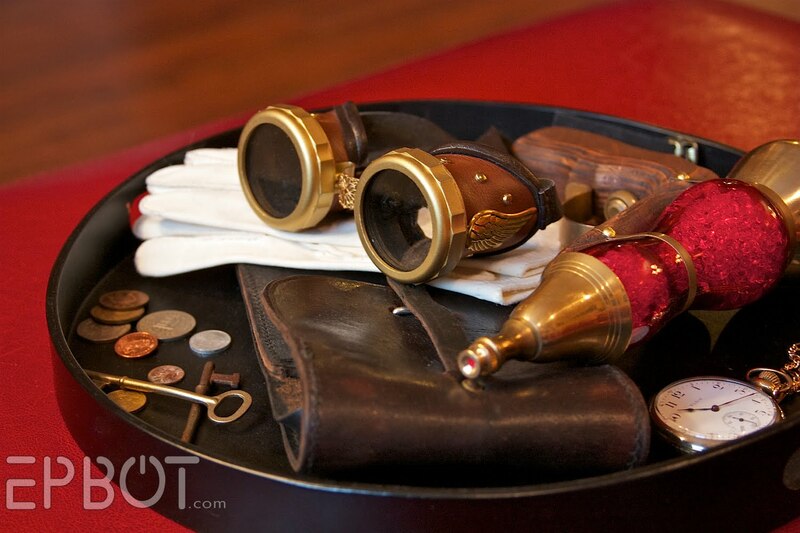 A shot of the goggles on an antique lace table cloth would also be nice. A tutorial on said goggles would be totally cool but you don't have to give away all your secrets! Is that the key? Old gloves? I wish I had figured that out sooner! I'm going to have to go shopping and searching soon. Winter is almost here up in the Frigid Northlands! 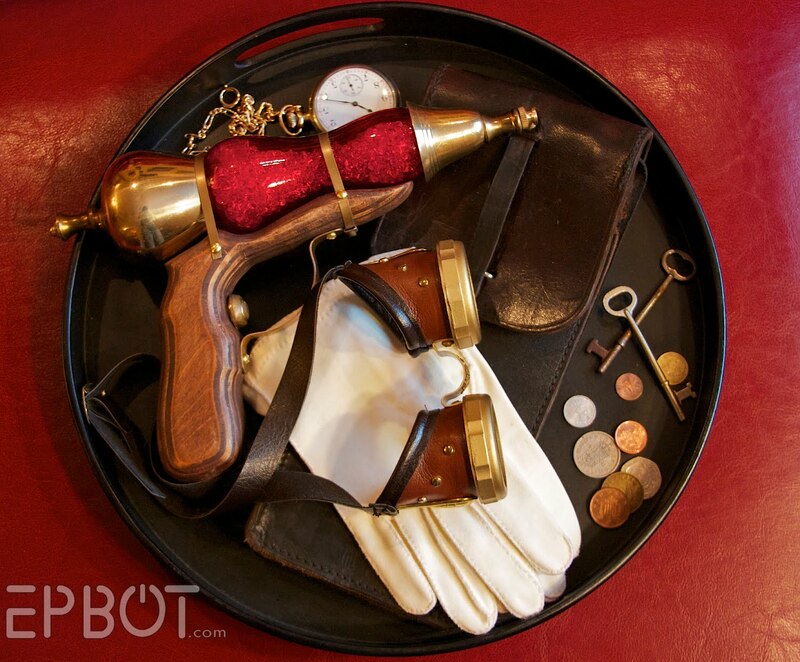 I'm hoping to find you steampunked up at Dragon*Con this year. Would be a pleasure and a privilege to take your photo. THANK YOU! I also have small, small hands and my friends and family frequently refer to them as carny hands. You know small, smells of cabbage... SO I LOVE the hobbit hands descriptor. It's a tad more refined. And I have the opposite problem with gloves. I have large hands and long fingers, so modern gloves are always a teeny bit too short in the finger, especially if I don't trim my nails, lol. I also have hobbitty hands and have to buy children's gloves (or usually I buy fingerless gloves). When my niece turned 10 I dramatically announced that I was going to tell her the family secret. She looked at me in awe and antici...pation. I showed her my stubby wee toes and told her that we are actually hobbits and that the fur on her toes should come in any day now. She was, well, NOT pleased. I feel you on the gloves! My hands aren't particularly dainty, but my fingers are short. I'm always annoyed by overhanging glove fingertips—they make it hard to do anything. Also, may I request a shot of the goggles on you and/or John in the tutorial post? I'd love to see them in action, so to speak. GORGEOUS. Both pairs. I'm so jealous of the ray gun!! I have one of those birds on the bocce balls, too! (Yours might be on a croquet ball....) He's a parrot named Sparkplug. =) I love that artist (can't recall his name). I can't wait 'til I can go to another one of his shows so I can get a songbird. Your Elgin watch looks very much like mine! Mine belonged to my grandfather- it's from 1941, so yours probably is slightly newer if it's your dad's- and the face is situated so that the 12 is under the stem rather than the 3 but other than that it's very very close. I've had the same problem with gloves. I can never find a pair that fit me in the fingers. My mum used to get fed up and just by me kids gloves. I can't even find work gloves that fit. In fact, I was turned down from zip-lining a few years back because they didn't have a pair of gloves to fit me. I like the photos of all the stuff on the round tray. Makes it look like you had to go through 1895 security. I have this mental image of the two of you sitting around the house in those goggles, just going about your daily lives. Love it. I totally have that problem with gloves! You're not alone at all. And these goggles are amazing. Are you planning to use them for cosplay? These are fantabulous! I'm super excited any time I see a new crafty project by you, you never cease to inspire me to add something to my already-quirky home. Oh, how cool, you have an Elgin watch? I'm from Elgin, IL (where the factory was) - as it happens, my mom actually runs the local history museum, so I hear all about the watches. May I ask what the year is on yours? Back on topic: the goggles and the ray gun look great. Nice work! I have the "too-small hands" problem with gloves too; actually, my winter gloves are usually OK, but any other gloves (riding, gardening, etc.) are invariably too big. I like being tiny most of the time, but there are some drawbacks. love the idea of the old gloves to fit us hobbit handed ones! now if i could only find some kid sized gardening gloves for working out in the yard! a year or two ago, kid's gardening stuff was all the rage and this summer there's not a kid sized gardening item to be found! I have the same problem with gloves. My fingers are short, so the gloves have to have short fingers to work for me. Around that time, my mother's boss's wife died, and while that was a major bummer, she was also high society classic Gentry, so I managed to score a whole bunch of epic vintage gloves, all leather and kidskin and whatnot, that fit my tiny prepubescent hands perfectly, and were excellent additions to my "scare them all away by being awesome steampunky and or goth" look ;). wonderful!! Can't wait for all the tutorials, especially the ray gun one! Oooo... I have what my family calls carney hands (I'm 5'9", but I wear a size 5.5 ring). Gloves are always too long in the fingers for me, so I just always wear the stretchy kind. I should try to find some older ones. Love the goggles. 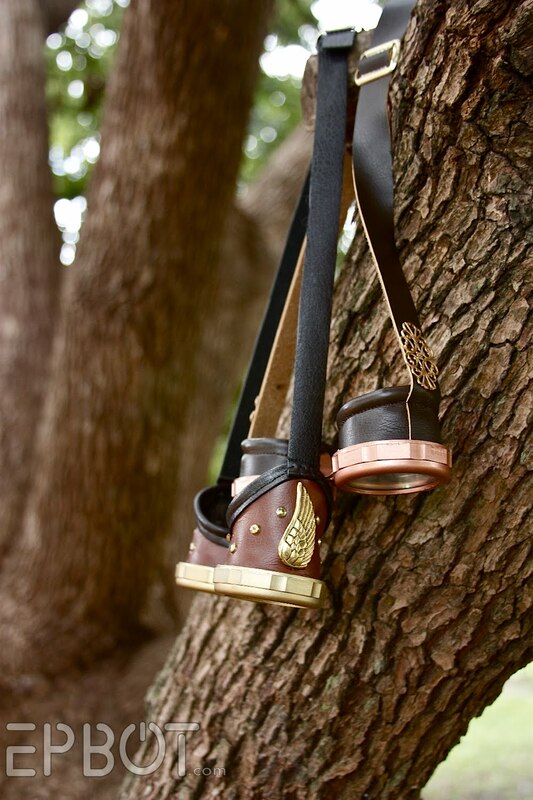 The only issue I have is the obvious lighter color on your strap. I don't know how you would dye the inside of the leather without it bleeding dye onto your skin or clothes however. Love the pictures though. Your goggles are awesome, but I love, love, love the ray gun! Also, how did I miss your steampunk parakeet? I understand your predicament with the gloves. I teach 8 year olds and most of them have hands the same size as mine (and a few even bigger). I want your life. You guys seems to just have so much FUN together! Keep on making the rest of us jealous! 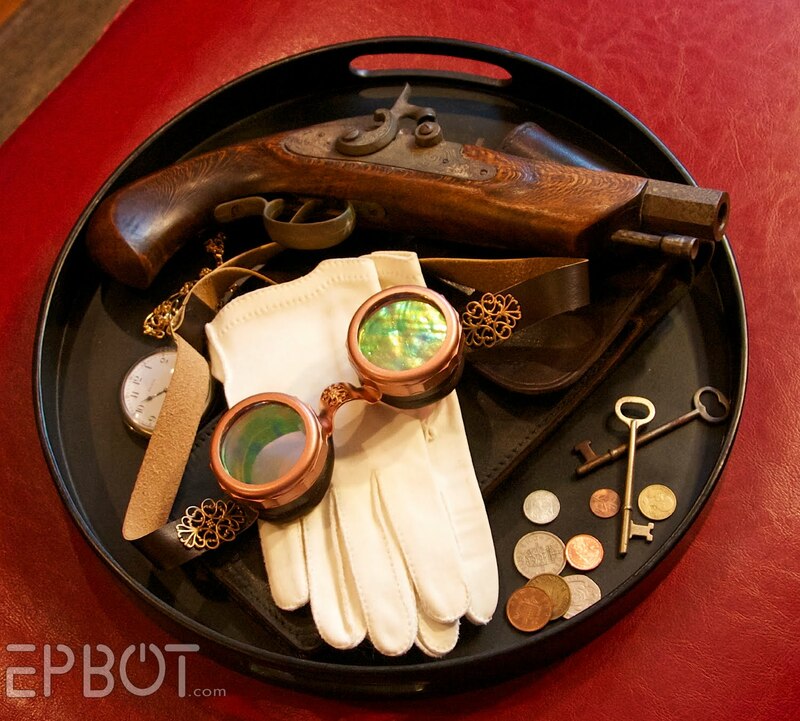 OMG, I am totally in LOVE with the goggles and raygun. I totally need to make some. I have the same problem with gloves. My husband calls me a midget. I'd prefer being called a hobbit (other than the hairy feet thing). I love that I can see tricksters choice in one of these photos! The goggles look wonderful, but my love for Tamora Pierce almost distracted me. Soooooo, when's the tutorial on John's ray gun? 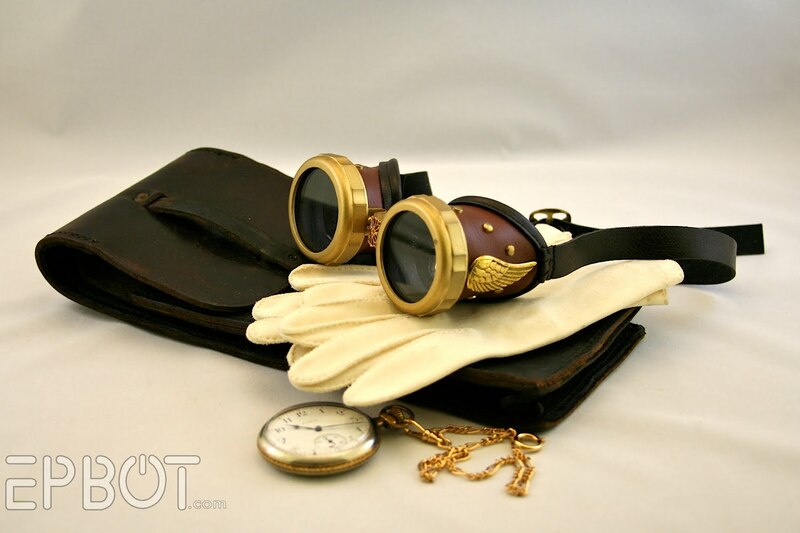 I'm not that crazy about goggles in general - we saw a bunch at Ohayocon, and they weren't a big deal for me. BUT, I LOVE these photographs!! 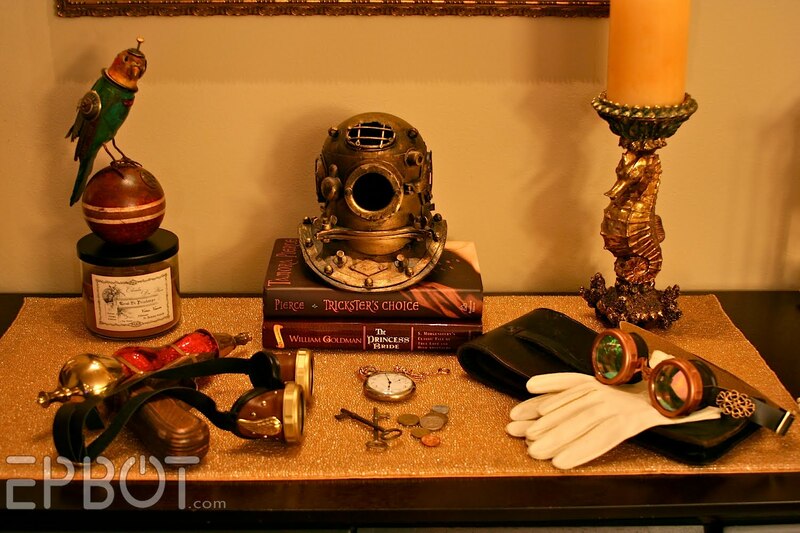 I would just love walking into someone's house, and seeing these displays on a side table. You are magic - you've changed my perception about steampunk goggles! Very cool! I would LOVE to see a tutorial on the ray gun!